The Drunk Heroes are a renown and well-respected guild known throughout the lands for their valor, heroism, and adventuring all conducted under the influence of tremendous amounts of alcohol. Founded in 752 G.E., their lore and history stretches over a thousand years of gallantry, ferocity, and drunkenness. Empty tankards emblazoned with the Drunk Heroes insignia can be found throughout Godville in the darkest of caverns and at the highest peaks. It has been said, on numerous occasions, that entirely new lands have been mapped, claimed, and conquered only to find a Drunk Hero had already been there; identified only by a trail of empty steins and slain beasts. The Drunk Heroes are known for their chaotic, drunken fighting style making them feared duelers. Often underestimated, a well trained Drunk Hero can deliver blows with large weapons including battle axes, hammers, and long swords at breakneck speed and with pinpoint precision. The Drunk Heroes are also known for their humanity, honor, and fierce loyalty. As master brewers and distillers, there isn't a taproom in Godville that doesn't carry at least one of the Drunk Heroes signature brews or spirits. Their bold red taps featuring the golden Drunk Split-Tailed Lion has become a worldwide symbol of good cheer, hospitality, and lively parties. Joining the Drunk Heroes is not for the faint of heart. Their requirements for warriors go beyond questing and fighting, requiring high levels of honor and alcohol tolerance. Once you've joined, it is customary to celebrate by taking three shots of a high alcohol spirit. Recommendations for your celebratory shots include rum, tequila, bourbon, scotch, or other full proof whiskeys. It is considered somewhat haughty and disrespectful to use vodka or gin for these customary shots, but if that is all that you have available, you are encouraged to take your shots anyway and reevaluate your liquor cabinet. Heroes seldom realize they're already a part of one of the best guilds in Godville and will attempt to leave and join another guild. This will stop once the hero has attained the rank of Cardinal by staying in the guild for 135 continuous days. In order to accomplish this task, the motivated god must check their hero each day to ensure they haven't started any quests that have them joining another guild. You can stop your hero's current quest by commanding them to do the following: abandon/cancel/drop/stop quest. Our guild members like to show their pride in being a Drunk Hero by adding the beer mug emoji (🍺) to their motto. It helps our guild stand out in the Pantheons and it shows our solidarity. Select and copy the beer emoji and paste it into your motto. Be active in the Guild Council and get involved in guild discussions. 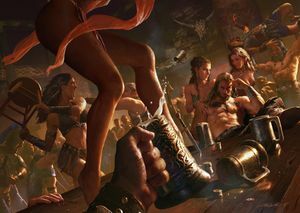 We also have a the Drunk Heroes Forum Thread that you can post to, which serves as the public billboard for our guild to the rest of Godville. The Drunk Heroes began as a social meeting of travelers at an inn near the center of the Jagged Peaks called Fjǫllóttrhǫll, or the Mountainous Hall. Fjǫllóttrhǫll was built in 645 G.E. 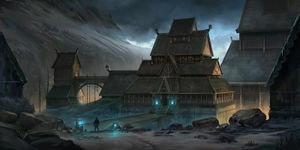 by Asgar Stoneheart where it became a major trading hub for travelers throughout the Jagged Peaks and a symbol of warmth and hospitality in the frozen region. The tremendous mental fortitude required to brave the mountains and the heavy use of alcohol to stave off the cold meant many likeminded travelers gathered at Fjǫllóttrhǫll to share drinks and stories of adventure. Over time, Fjǫllóttrhǫll was expanded to include a brewery and distillery, two bars, a sauna, and extensive accommodations. Asger Stoneheart's passing in 738 G.E. left Fjǫllóttrhǫll without an innkeeper, which worried many travelers in the region who wanted to keep the critical mountain hub out of the wrong hands. Ownership of the inn was transferred to Stoneheart's last remaining next of kin, a distant cousin named Tacitus Stoneheart, then Archduke of Tradeburg. Tacitus immediately seized ownership of Fjǫllóttrhǫll and began alterations to the inn to turn it into a private vacation home. A typical scene inside one of many of Vanirhǫll's taprooms. Artwork by Age of Conan. Seeing the impending conflict and ongoing threats from outside agitators, many of Fjǫllóttrhǫll's regular patrons came together to retake ownership of the inn. They called themselves the Drunk Heroes of Fjǫllóttrhǫll, and the battle that ensued lasted over two hours, called The Battle of Fjǫllóttrhǫll, which resulted in the death of 200 of Stoneheart's soldiers along with Tacitus himself. The Drunk Heroes only numbered in the low twenties. Over time, travelers to the inn began to call themselves Drunk Heroes, and the name spread throughout the land to identify travelers and regular patrons to Fjǫllóttrhǫll. 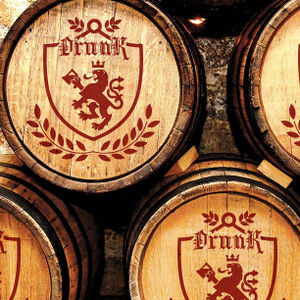 After a rapid expansion of Fjǫllóttrhǫll's facilities and realizing the full scope of Fjǫllóttrhǫll's value as a strategic target, the patrons came together and formally commissioned the Drunk Heroes guild in 752 G.E. They immediately renamed Fjǫllóttrhǫll to Vanirhǫll, or Hall of the Gods, mainly because Fjǫllóttrhǫll is impossible to pronounce while drunk. Vanirhǫll remains the home and central headquarters of the Drunk Heroes, and it also represents their main source of income through the trading, brewing, and distilling activities that occur there. The inn still plays host to independent travelers and traders making their way through the Jagged Peaks region, of which the Drunk Heroes see as valued allies and potential recruits. The Drunk Heroes' singular founder was a hero and Jagged Peaks traveler named Divinius. Divinius lead the siege at the Battle of Fjǫllóttrhǫll and later signed the formal commission for The Drunk Heroes, along with his small, motley crew. Little is known about Divinius as he disappeared shortly after the guild's formation. Legend has it that he over-indulged in his favorite pastime, drinking, until he forgot about the existence of the guild. Only one of the original members that was involved in the founding of Drunk Heroes remains; the rest are rumored to have suffered the same tragic fate as Divinius and have since disappeared or left the Jagged Peaks region under mysterious circumstances. Vanirhǫll is where the Drunk Heroes call home: a massive, sprawling Viking fortress deep in the frozen mountains of the Jagged Peaks. Because of Vanirhǫll's many natural barriers and frigid temperatures, it lacks high walls and watch towers, which are instead built into the mountainsides. Vanirhǫll has never been directly attacked because the subzero temperatures require so much alcohol in order to cope that no invading army has has ever survived the journey. Vanirhǫll, or Hall of the Gods in Norse, is the home and brewing/distilling headquarters of the Drunk Heroes guild. Artwork by Jordan Grimmer. Vanirhǫll operates as a massive indoor city built into the sides of the mountain and heavily insulated against the subzero temperatures beyond its walls. Heavily expanded from its humble beginnings, it now boasts all of the amenities its guild members require including including 327 bedrooms, 4 mead/feasting halls, 6 taprooms, 2 full service restaurants, 25 saunas, 5 bath houses, 7 breweries, 3 distilleries, a winery, a large scale armory/stables, 4 metal smiths, and 2 tailors. Beer brewing at Vanirhǫll is one of the Drunk Heroes' most cherished and time-honored traditions and Vanirhǫll's largest source of revenue. Considered the best of Godville's beers and liquors, the Drunk Heroes insignia has become a universal sign of quality and largely the gold standard with which all other brews and spirits are compared. Vanirhǫll's 7 breweries output 432,000 barrels of beer every year, including ales, stouts/porters, lagers, pilsners, and specialty runs of mead. Distilling and winemaking are new additions to Vanirhǫll. Using imported grains, sugarcane, potatoes, and grapes, the Drunk Heroes produce a variety of spiced rums, whiskeys, vodkas, and wine which are critically acclaimed and near universally enjoyed. Beer kegs emblazoned with the Drunk Heroes insignia. Also adding to the Drunk Hero's income stream is a fully functioning inn that hosts traders and travelers as they pass through the Jagged Peaks. The region hosts a major economic zone with active gold mines, fur trappers, loggers, adventurists, and tourists. There's also an extensive network of ruins and deep caverns built by an ancient race of dwarves that draws a large following of adventurists and tourists seeking treasures, magical items, and exotic metals. Nearly all of these industries pass through Vanirhǫll in one way or another while experiencing the Drunk Heroes hospitality first hand. Much of Vanirhǫll's visible exterior is made of solid wood set on a large concrete foundation that extends down into the permafrost. Over 150 lacquered giant sequoia pillars were processed on site during the fortress' continual expansion; some of the pillars reach up to 8 meters in diameter. Because Vanirhǫll's construction took place over several centuries, wood, architectural style, and construction technology has changed contributing to Vanirhǫll's often confusing and sprawling citadel. Vanirhǫll's foundation runs nearly 100 meters into the ground, completely hollow, with 20 floors of wood-lined promenade looking down on Vanirhǫll's largest mead hall built into the bedrock below. Leading out in all directions are various living quarters and the famous Vanirhǫll bath houses and saunas heated by natural hot springs. Nearly all of Vanirhǫll's interior features are wood finished, including the underground corridors, with some areas combining wood and stone architecture. Ornate tapestries, commissioned paintings, and game trophies occupy most wall space. When paint is used, red trim appears on rare occasions, but the majority of the interior space is lacquer finished showcasing the quality of the wood and milling. 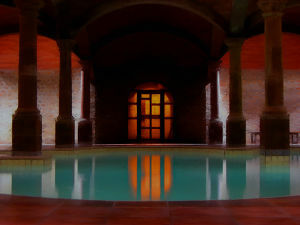 Heating for the massive interior is piped in through natural hot springs maintaining a comfortable 72 degrees inside. With the natural mountain barrier and long cold season with subzero temperatures, Vanirhǫll relies heavily on its strategic location for defense. A continuous watch of guards patrols a series of towers built into the mountainside, and Vanirhǫll itself is only accessible by two heavily patrolled and gated passes on the north and south ends. In terms of active defenses, catapult, ballista, and archer battlements are constructed into the mountainsides and ready for deployment from the central armory. An early warning system is built into the mountain peaks along critical passes within visual distance and staffed by a monthly rotation of over-watchers. In the event of a serious emergency, mountainsides planted with explosives can be blown to obscure passes or open chasms designed to starve armies attempting a siege or retreat. A rare view into one of Vanirhǫll's many bath houses. The waters are kept at a comfortable 103°F by natural hot springs. A Jagged Peaks tradition, bath houses or saunas are found in nearly every dwelling in the region and are fed by the abundant hot springs that dot the geologically active mountains. Vanirhǫll is no exception. 25 saunas and 5 large bath houses are available for use by travelers to the inn and guild members as well. The bath houses and saunas are located in the western wing of Vanirhǫll with over 10,000,000 liters, more than four olympic swimming pools, of naturally heated waters. Vanirhǫll's massive supply of naturally warmed springs and saunas and the lack of gender restrictions pull in thousands of individuals every year seeking rest and relaxation including many of Godville's kings, queens, and famed adventurers. Vanirhǫll features a wide variety of dining and drink options including 4 mead/feasting halls, 2 full service restaurants, and 5 taprooms. 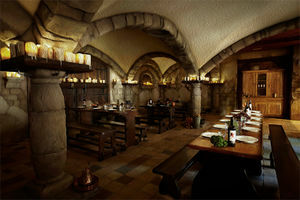 The feasting halls include The Boar's Head, Rabbit's Tail, Bear Foot's, and the largest, The Grand Hall. Each seat between 100 and 200 individuals with The Grand Hall able to seat up to 500. The feasting halls are distributed throughout Vanirhǫll and mostly service guild members for three meals a day and celebrations (although regular inn patrons do utilize the feasting halls on occasion). The Grand Hall sits at the base of Vanirhǫll overlooked by a massive atrium lined with 20 floors of wood promenade. The Grand Hall is reserved for special occasions, award ceremonies, and holiday events. A look into Lion's Gold, Vanirhǫll's famous wild game restaurant featuring rare and exotic eats from around Godville. Vanirhǫll's two restaurants include Flat Iron's, and Lion's Gold which play host to some of the Jagged Peaks region's greatest chefs. Typical faire includes wild game at Lion's Gold and more traditional lamb, beef, goat, and seafood at Flat Iron's, but the menu selection varies daily depending on season and what product is available. The restaurants mostly draw patrons from the inn and surrounding countryside. The world renown taprooms of Vanirhǫll (6) include Beer Hunter's, The Golden Brick, The Royal Ark, Split Tail, The Drinking Horn, and The Arena. The taprooms feature a wide variety of beers, wines, and spirits including those brewed or distilled by the Drunk Heroes. To be featured or regularly carried at one of Vanirhǫll's famous taprooms is one of the highest honors a Godville brewer or distiller can be bestowed. This page was last edited on 22 May 2018, at 07:46.